PAPB Semarang Integrated Islamic Middle School (SMP IT PAPB Semarang) in collaboration with Gold Pencil Indonesia held an international cartoon exhibition on 10-17 February 2019. This exhibition titled "PAPB International Cartoon Festival 2019" was opened by the Mayor of Semarang City, represented by the Head of Semarang Education Office, Gunawan Saptogiri on February 10, 2019 at 10:00 WIB. This cartoon festival is a series of 15th SMP IT PAPB Semarang Anniversary events. The festival takes the theme "Unity in Diversity" or Bhinneka Tunggal Ika. This theme was chosen because it is very relevant to the current condition of the nation. In addition, the values ​​of diversity are also in line with the vision and mission of the SMP IT PAPB Semarang. The PAPB cartoon festival this time turned out to get positive support from world cartoonists. The committee has sent invitations for participation to cartoonists in 66 countries at the end of December 2018 with the deadline of February 1, 2019. Although the deadline for receiving works is quite strict, the enthusiasm of the cartoonists involved is quite high. In that short time, the committee has received as many as 1511 works. Consisting of 1091 works of professional cartoonists from 57 countries and 420 works by students from 7 countries. For the professional category, the most participants came from Indonesia with 75 cartoonists. Iran followed with 57 cartoonists and Turkey with 29 cartoonists. 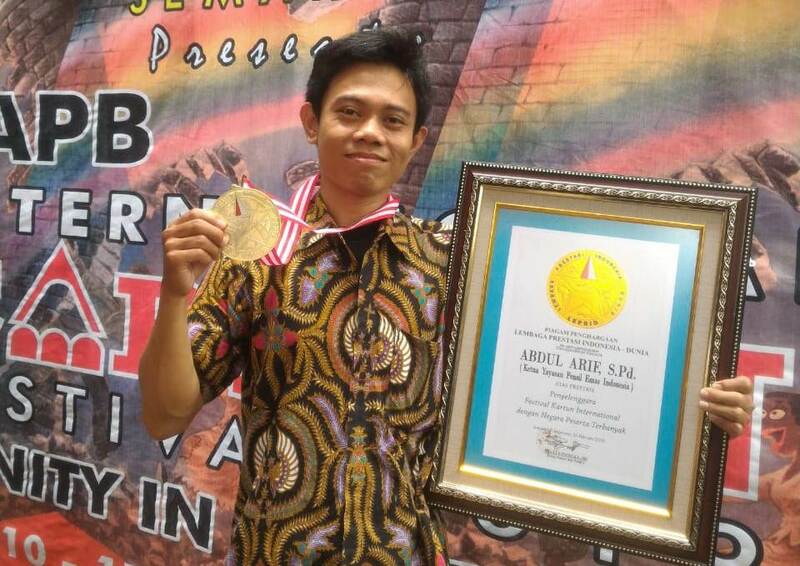 While for the student category, the largest number of participants were from Indonesia with 254 students. Followed by Turkey with 34 students and Russian with 24 students. The committee has done a selection of works on 5-6 February 2019. There are three judges involved in this selection, namely Jitet Kustana (Founder of Gold Pencil Indonesia), Koesnan Hoesie (Senior Cartoonist Semarang) and Bagus Kholid Zamzami (junior high school IT PAPB teacher). This selection is to determine the chosen work to be exhibited. There are 100 professional works and 47 works of selected students. As a form of transparency, this finalist work is published publicly through mercusuar.id website to ensure the originality of the work. 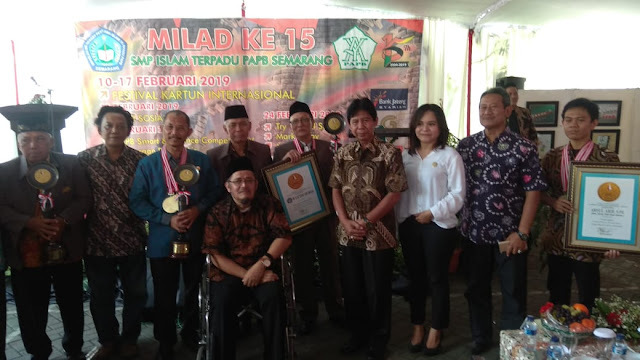 The PAPB International Cartoon Festival event this time also broke the record for several categories from the Lembaga Prestasi Indonesia Dunia (LEPRID). 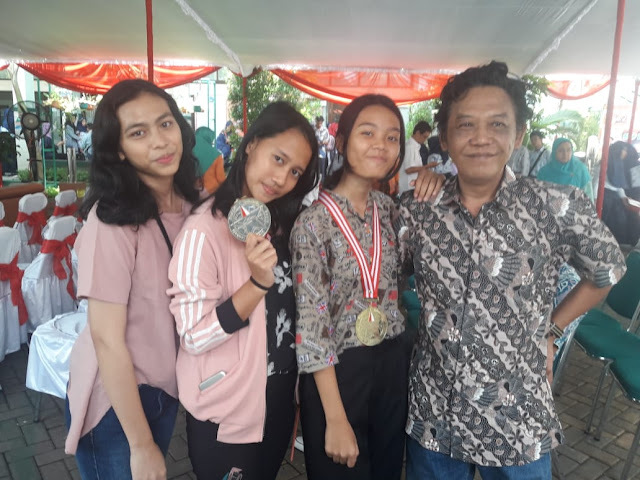 That is the category "The first school in Indonesia that organizes the International Cartoon Festival" and "The School that organizes the International Cartoon Festival with the most participating countries". 0 Response to "Photo Gallery of The Opening Ceremony of PAPB International Cartoon Festival 2019"